The Sun Dolphin Boss SS is an interesting sit-on/stand on top kayak that is aimed specifically at anglers. Anyone that has strolled through Wallmart might find this kayak to be very familiar as it is being sold there as the "Ozark Trail Pro Angler 12." As for the kayak, it has been designed to provide great tracking and maneuverability on the water. Of course, as it is a fishing kayak, it also has plenty of features geared towards angling in comfort. The Boss 12 SS is about 12.3 foot long and has a width of 33". It weighs in at 78 lbs, which in turn translates to about 500 lbs of capacity. The selling point of this kayak is that it is not just feature rich, but also affordable, which is something that they have definitely accomplished. 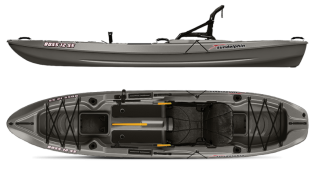 Sun Dolphin has managed to keep this kayak reasonably priced while still including extras that are more commonly found on kayaks that are much more expensive. Since it uses a catamaran hull, the Boss 12 SS is a very stable kayak, which means it makes for a good fishing platform. Anglers who prefer sitting down will appreciate the adjustable footrests as well as the comfortable seat that can be adjusted to a high or low position. A stand assist strap will help you to get up and the anti-slip decking will provide you with sure footing while reeling in a big catch. For storage the Boss 12 SS has quick lock water proof hatches that can be found at the bow and stern of the kayak. It also has large front and rear gear wells where you can secure additional gear using the bungees. These wells are large enough for a milk crate or bucket, so storage is definitely not a concern. Of course, since this is a fishing kayak it comes with four flush mount rod holders, in addition to a swivel rod holder. Other conveniences include carry handles, paddle holders and a beverage holder. Considering the price and features of the Boss 12 SS there really isn't much to complain about. It's not the biggest or best angling kayak on the market, but anyone with a tight budget will really appreciate how feature packed it is. If you are looking for value for money and want to stretch your budget a little further, then this is a good option.